The Farmington River that most fly anglers talk about is the West Branch of the Farmington River, in particular the section from Riverton downstream to New Hartford. This section of river, which has the highest trout population density in the state - rivaling some western waters - is the product of a 200-foot-high dam which releases a fairly consistent flow of cold water year round. This is called a tailwater fishery. Additionally, access on the river is completely unrestricted in this section, which also includes two Trout Management Areas, the Upper TMA reserved for catch and release fishing with barbless hooks only. The Upper TMA, considered the best area for anglers, particularly those looking for dry fly fishing, runs from one mile above the Route 318 bridge downstream to the Route 219 bridge. 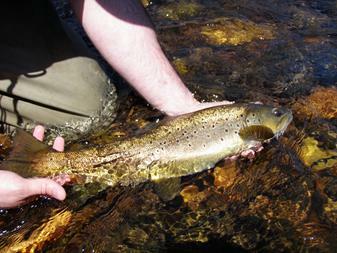 The river is heavily stocked with adult trout, with the average fish in the 12 to 14 inch range. 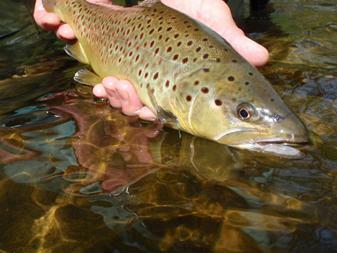 Much larger trout, mostly brown trout, can be caught, with many fish over 20 inches hooked each season. 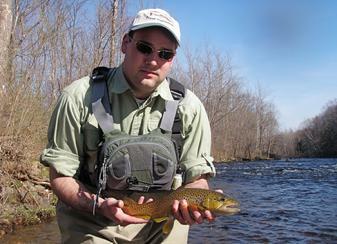 On the Farmington River, there is no problem using a long, heavy weight rod. Most anglers fish with a 9-foot, 5-weight rod, though some will use shorter, lighter rods when casting dry flies, and others will use longer, heavier rods when fishing nymphs or streamers. Anglers planning a full day, weekend or longer on the river should bring a few rods and reels, and also an assortment of lines. 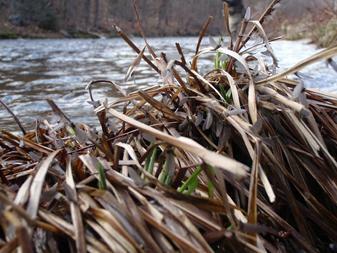 While the Farmington River is known for its prolific insect hatches and many dry fly pools requiring tactical casts and gentle presentations with floating lines and long leaders, in the deeper and faster pools and currents a sink tip line is recommended. 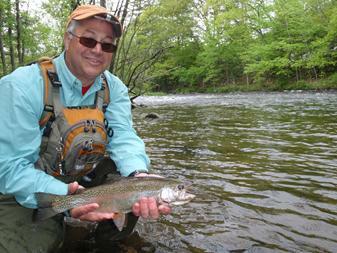 For leaders, it is best, also, to have an assortment when fly fishing the Farmington River. For mid-summer dry fly fishing, many an angler has watched in frustration as their fly floats undisturbed through a thick pod of trout feeding on the surface. Because the Farmington River is such a productive river, it receives a significant amount of fishing pressure and the trout quickly become experts at spotting an imitation fly among a sea of naturals. for dry fly fishing a 9-, 12- or even 15-foot leader in 6X through 8X is recommended. Some anglers even go down to 10X to 12X on their tippet, though this makes it harder to land large fish. When nymphing, a 9-foot 5X or 6X leader is adequate, and for streamer fishing a 9-foot 3X or 4X is the best choice. While the basic flies (pheasant tails, hare's ears, wooly buggers, light cahills, sulphurs, hendrickson, griffith's gnats and the like) work well, what works best on a given day depends on what's hatching and what the trout are showing interest in. Local fishing shops and shops on the Farmington River will be able to point anglers in the right direction. To get to the Farmington River, anglers should take Route 8 north to Route 44 and then head east. A left turn on route 318 towards Pleasant Valley takes anglers to the head of the Upper TMA at the Church Pool, where a blue steel bridge crosses the river. Anglers can head up either East River Road or West River Road, which, as their names indicate, parallel the river on the eats and west sides all the way north to Riverton. Another option is to head south on Route 181, River Road, for additional access within the TMA. Route 181 comes back out on Route 44, which leads through the town of Barkhamsted to New Hartford, where Route 219 marks the downstream end of the Upper TMA.